The disaster that almost happened. We were sitting in our apartment last Saturday morning when there was a huge crash outside the window. 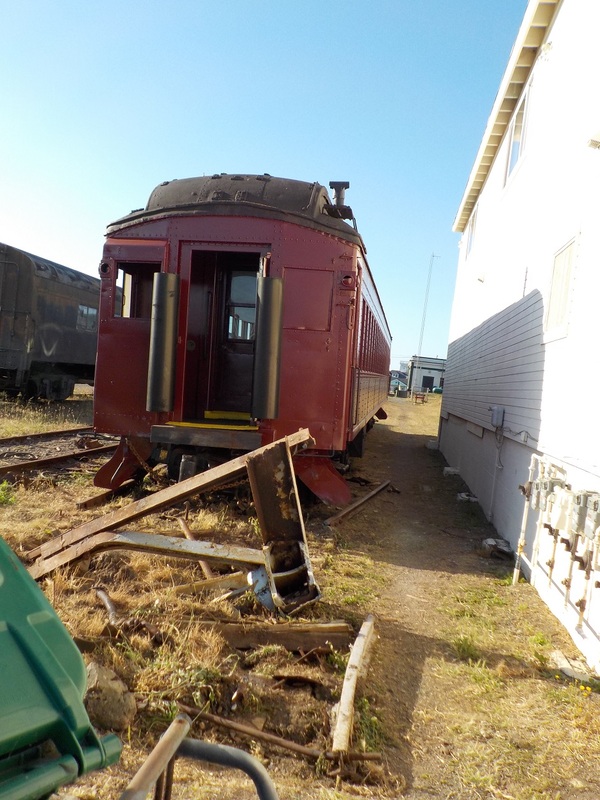 We jumped up and looked out and the train car that usually sits down the track a hundred yards or so was right under us. There is a corner of a green recycling barrel on the left. 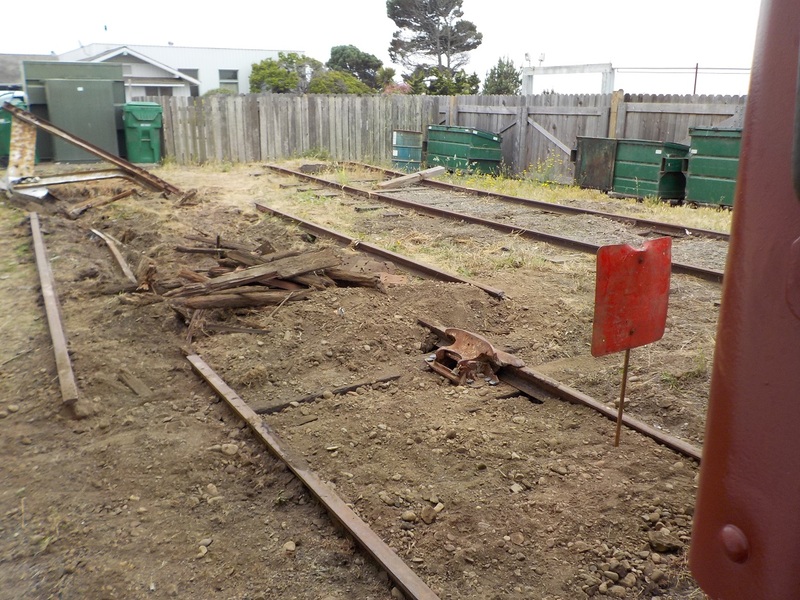 The metal frame that was intended to block the end of the tracks fell off its concrete base The three green barrels were crushed against the electric company connection boxes for our building, and seem to have kept it from getting knocked over. As you can see in the next photo, the train (now moved) was backed up against the electrical boxes, Just beyond it is our car. I’m so glad that the train ran out of track and stuck in the ground, merely squashing the recycling cans. If it kept going and knocked out the electrical service it would next have crushed our car…Now that would have been a disaster! Men came out to try and get the train back on the tracks. They gave up and came out again on Sunday. 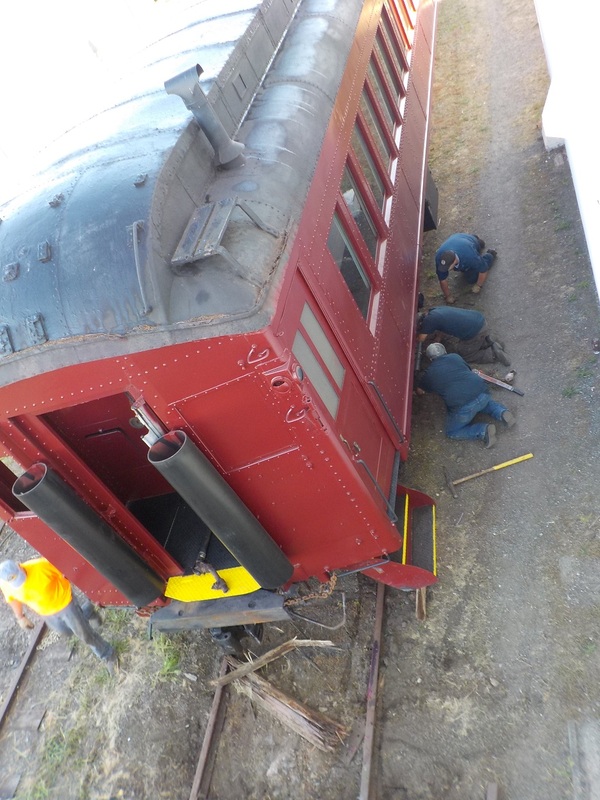 With iron plates and hammers, they tried to get the rear wheels back on the rails just the way you would try to get a car out of sand using boards. It didn’t work. 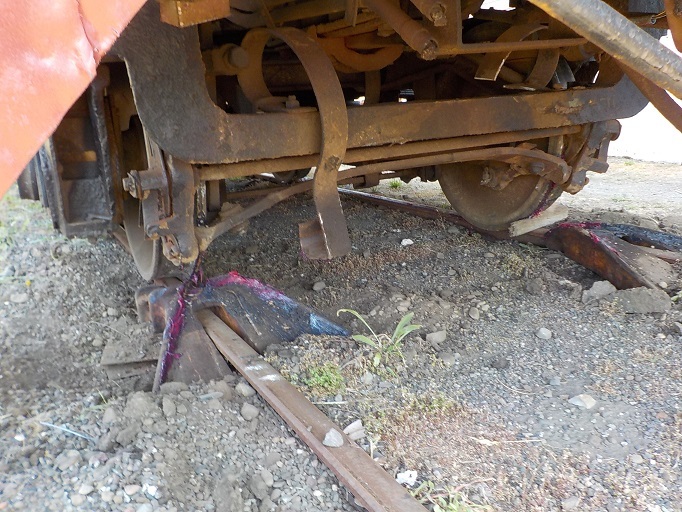 On Monday, however, the right tool was obtained and the train got back on the track. It was a triangular guide that is used just to funnel train wheels back on rails. 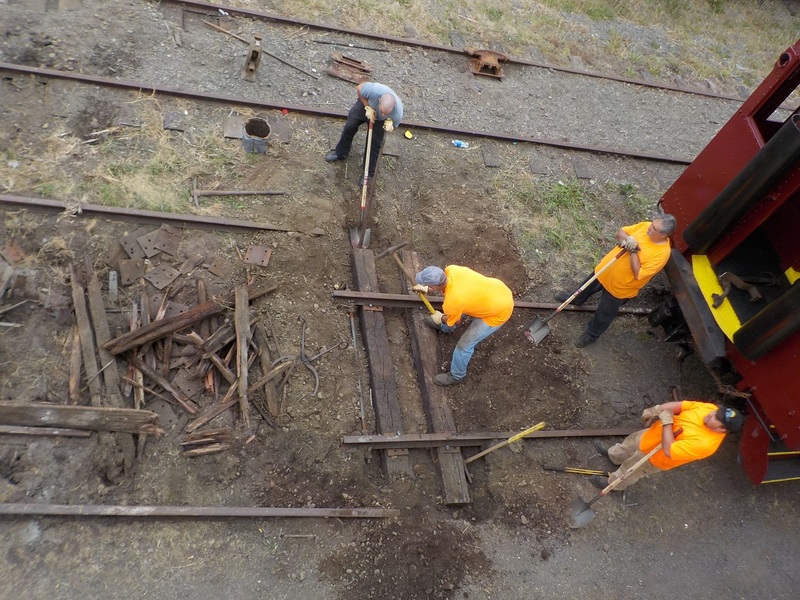 A different group arrived to dig up and replace two ties at the very end of the rails. 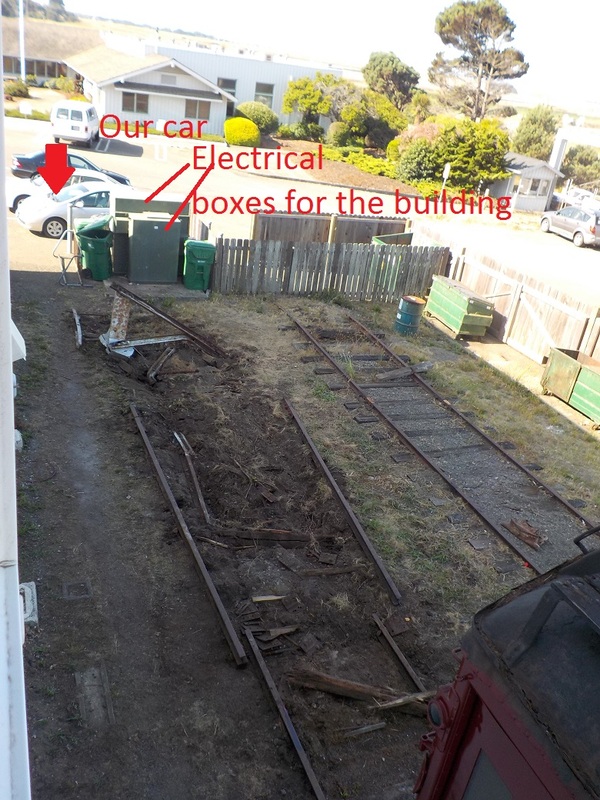 Notice that the “end” of the track is now much further from the electrical boxes than it was before the accident. Now the square red sign seems to indicate the end of the line. 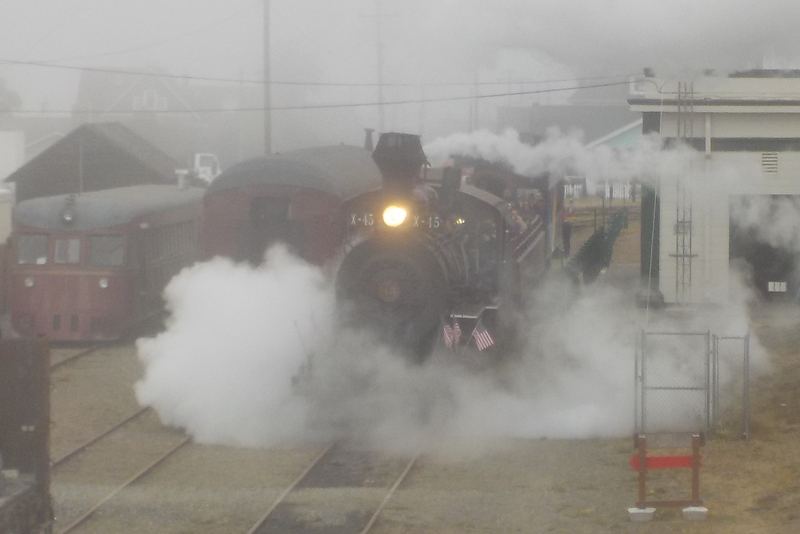 The train is called the Skunk Train and it follows and old logging route. We have not taken it because most of the route is closed for repairs, but it goes out for an hour twice a day in the summer. 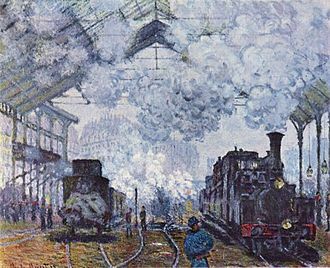 On some days they use a steam engine and it is a sight reminiscent of Monet’s paintings of Gare St. Lazare (same engine), tendrils of steam curl up the sides of the engine while clouds of it emerge from the smokestack. The engineer uses the steam whistle a lot on those days. 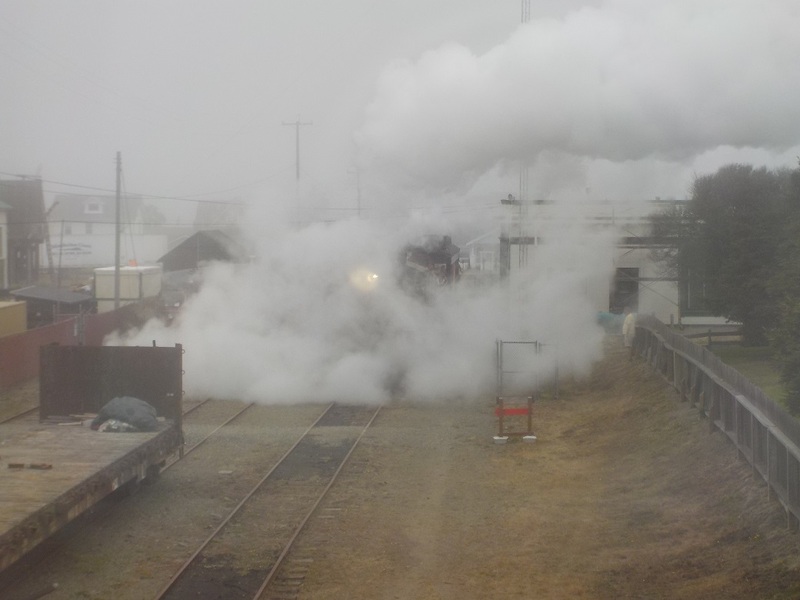 The train pulls out in a cloud of steam.